The summer season is now behind us, and in some ways it feels like it will not be remembered as a ‘golden summer’ for property. Having said that, I feel we are all too often conditioned to the belief that the property market should be hyper-active, with prices spiralling ever-upwards. The reality is today’s market is a great market. It’s a normal market. Buyers have a great selection, sure they are judicious about what to purchase and what to offer; but with such attractive mortgage rates they are not slow in coming forward. Sellers on the other hand are confident to bring their property to the market, with realistic expectations around market price which reflects the state of the market. The key number in this month’s report remains the inventory of properties for sale. From a high at the end of February of 79, one month later that’s risen to 83, with the addition of 23 new properties advertised in March, contributing to a total of 84 new listings coming onto the market since the start of the year. This compares with 68 for the same period a year ago. 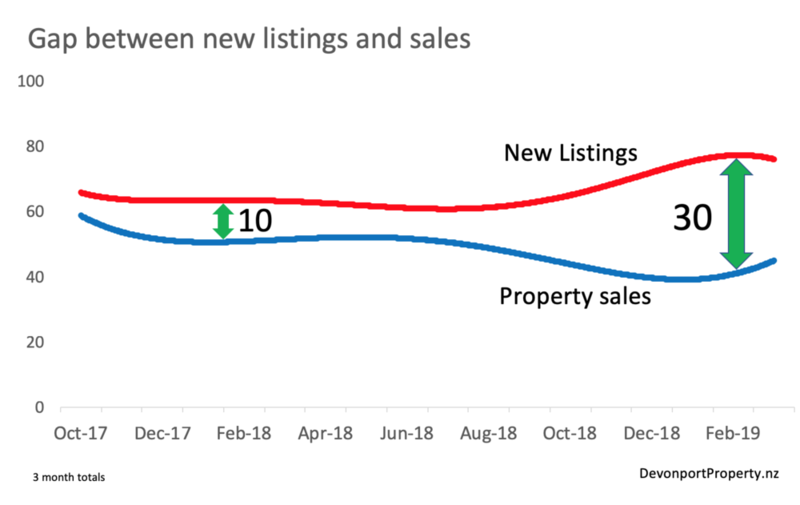 This growing inventory can best be seen in the chart below with a widening gap between new listings and sales. This began at the start of spring last year and has widened through the summer. There are though signs, as the chart highlights, that the gap may be narrowing as sales slowly edge up and new listings ease. Certainly, the early weeks of April have seen very few new listings hit the market. Property sales remain subdued with 44 properties sold since the start of the year down from 53 for the same period last year. The level of 83 properties on the market represents an inventory level equating to 24 weeks stock (assuming the current rate of sale to clear the 83 properties on the market). This level of inventory is a very stable level. Levels much below 16 weeks which we’ve experienced over the past 5 years are a function of a very tight market, one in which prices spiral upwards. The chart below tracking the 3 month moving sales and price changes continues to show the market below the levels of last year as has been the case for the past 6 months. There are exactly twice as many houses for sale at the end of March (66) as were on the market a year ago. As stated earlier this is more a reflection of the end of the ‘golden summer’ last year when the property market was still powering-on albeit on the last drops in the fuel tank before the market corrected as the year progressed. Sales of houses are down 16% compared to this time last year but in absolute terms we are talking about 37 sales as compared to 42 sales. The median price at $1.7m based on the most recent 3 months of sales is down 8%, but as the chart below shows prices move around quiet considerably and the overall trend of the past couple of years shows a more stable market. There is certainly more stability in the market for investment and owner-occupied units that there has been at any time in the past 12 months. Whilst low listings and low sales continue to impact this segment, the fact is that there is strengthening in median sales price which had been weak for much of the past 18 months. At $772,000 the current 3 month median price is just 1% below the same time last year again reflecting a new stability in the market.